What is my Google My Business page? Why should I manage my Business page? How do I set up my Google my Business listing? How do I embed my tour in my website? Why has the view of my premises from Street View not changed? How do I delete a picture from my Google photo album? Google My Business is a free internet listing which helps your business optimise its online presence and perform well in local searches. Potential customers will see these details on a Google Maps search when they search for businesses like yours in your area (like the image on the right). It is also easy for mobile users to contact you direct from this listing with just one click. If you did not already have a Google My Business listing, we set this up with basic information about your business when your virtual tour went live. However, it is down to you to confirm your listing, add your full business information, and then keep the details up to date. It’s simple and quick to do. Your Google My Business listing holds information on your business which helps it get found online. By taking management of this page, you are able to add and edit your own information. Everything on Google is driven by one user login or account. This can be a Gmail email address or your own email account. If you have A Google account already, all you need to do is to login. If you don’t already have one, you can quickly set up a new account with Google. Go to www.google.co.uk/accounts/newaccount and complete your details. You can register with a current email address or set up a new Gmail email account. 4. How do I set up my Google My Business listing? Google My Business is a free listing on Google which holds information about your business to help local customers find you when searching online. This must be set up for us to link your virtual tour to it. 1. If you already have a Google account, sign in now. If you don't have one yet, you will need to set this up first (see FAQ 3. above) and sign in. 3. Click 'Get on Google'. 4. Type in your business name and location to see if it is listed. If it is, click on the correct details and you will then be asked to confirm that you are authorised to manage the business. If not listed, click on the option to 'Add your business' and complete the details required. 5. Verify your account. Google requires you to verify your association with the business, which can be done by phone call or text. If using the phone method Google will send your verification code via an automated call, so make sure you are able to answer the phone number you have given them straight away. 6. Google will also confirm your verification by post. In the meantime, you can click 'Continue and verify later'. 7. Your listing has now been created. You can add details such as photographs and a profile picture. Select 'Edit' and you can add a business introduction, phone number, opening hours, website link, and additional business categories. Click on 'Finish editing' when you're done. You can always return to change and update this later. We recommend you complete as much as possible as this gives potential customers information about your business on Google and helps you stand out from competitors. 8. Complete the verification process by clicking on 'Verify now'. 1. Login to your Google Account (or follow instructions above to set up an account). 2. Go to your Google My Business listing (we sent you a link to this in the email telling you your tour had gone live). 3. At the bottom left-hand side of the page is the option to 'Claim this business'. Click on this link. 4. Google will then ask you to 'Confirm your business'. Check this is the correct information, then tick the box which says 'I am authorized to manage this business and agree to the Terms of Service'. 5. Google will then ask you to 'Verify your business'. With 'Call me now' option, Google will call you immediately on the number it holds on the page for your business. You will be given an automated message with your verification code. Make sure you are ready to write this down or input straight into your computer. With 'Mail me now' option, your code will be sent by post within 1 to 2 weeks. You will then need to return to this page via your Google account to enter the code. Click on the option you require. Once you have received your code, enter this into the box given and click 'Submit'. You will see a message confirming your verification has been successful. 6. Click 'Continue' to 'Check out your Google My Business dashboard and customize how your business appears on Google.' At this stage, you can choose a short introduction on Google My Business, if you wish. 7. To make changes/additions to your business details, click on the 'Edit' button on the top right of the screen. The more details you add about your business (including photos), the better your business should perform in Google searches. In particular, using keywords in your description which potential customers may enter when they are searching for businesses like yours. If you have a website, we recommend you embed your Google Street View tour into this to encourage viewers to take a look inside your business. 1. Access your virtual tour either via your Google My Business page or maps.google.co.uk. 2. Click the vertical line of 3 dots to the right of your business name (top left of screen). 3. When the pop-up box appears, click 'Share or embed' image. 4. In the box that appears, select the 'Embed image' tab. 5. Choose the embed size you want (small, medium, large or set your own custom pixel size), then copy the HTML code. 6. Go to your webpage editing application and locate the best place for the tour within your website. Then paste the copied code into the HTML code at the point at which you want your tour to appear. 7. Save your web page and view the tour you have just embedded, live on your site. If you would like any help with this process, get in touch and we can embed your tour for a charge of £50 +VAT. This changes only when the Google cars go past and take photographs, which is usually around every three to five years. We cannot alter this, but we can link to it by connecting your tour with Street View. 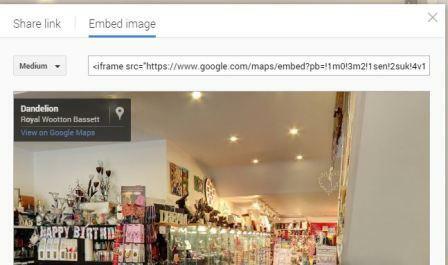 When searching for you on Google, a ‘See Inside’ link will appear rather than a link to Street View, giving a direct link to the interior of your business. If customers walk outside to get their bearing and go onto Street View, it is then obvious to them that it is your business in the premises now and the Street View images are old images. 8. How do I Delete a Picture from my Google Photo Album? 1. Go to your Google My Business page where you can make changes to your business information. If you have not already verified your business listing with Google, you will need to do this first (see FAQ No. 4. above). 2. In the 'About' tab click on the picture you want to delete, which will then be expanded on your screen. 3. At the top of the screen click on 'More', then on 'Report abuse'. A list of options will appear, with the top one selected as 'This photo is not relevant to this business.' Click on 'OK' and you will then receive the message 'Thanks. We've received your report and will review it soon. If we find this content to be in violation of our User Content and Conduct Policies we will remove it.' Click on 'OK'. Your picture should be removed shortly. If you want to change/add details to your business listing, the first thing you must do is make sure you have verified ownership of your Google My Business page. To do this, see FAQ (above). Once verified with Google, you'll be able to make amendments and additions to the information on your page. Google's own instructions on how to edit/report issues with Google Maps and business details listings can be found here. If you want to report an error about a business on Street View, first you'll need to locate the details on Google Maps and then select 'Suggest an edit' on the top left hand box of your screen (see image far right). A box appears which allows you to suggest changes or enter comments. If you want to report an issue with a particular image on Street View, go to the relevant image and click the vertical line of 3 dots at the top left of the screen. 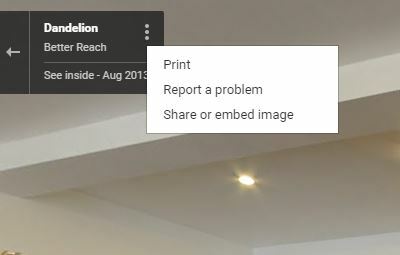 Select 'Report a Problem' and a menu will appear with the option to report a number of issues (see image right). Don't want to do any of the above yourself? Ask about our Google Presence Management service and we'll take care of it all, including keeping your details up-to-date.